"Sampath Speaking" - the thoughts of an Insurer from Thiruvallikkeni: wreck of legendary ship of Capt Cook - HMS Endeavour is located !! wreck of legendary ship of Capt Cook - HMS Endeavour is located !! Kalaniʻōpuʻu-a-Kaiamamao (1729 – 1782) was a Hawaiian monarch, who was called Terreeoboo, King of Owhyhee by James Cook and other Europeans. He was the king of the island during the times Captain James Cook came to Hawaiʻi and went aboard his ship on 26 November 1778. They exchanged gifts but that friendship was not to last longer ! US Space Shuttle Endeavour (Orbiter Vehicle Designation: OV-105) is a retired orbiter from NASA's Space Shuttle program and the fifth and final operational shuttle built. It embarked on its first mission, STS-49, in May 1992 and its 25th and final mission, STS-134, in May 2011. The United States Congress approved the construction of Endeavour in 1987 to replace Challenger, which was lost in 1986. Structural spares built during the construction of Discovery and Atlantis were used in its assembly. NASA chose, on cost grounds, to build Endeavour from spares rather than refitting .. .. ..
Captain James Cook FRS [1728 – 1779] was a famed Explorer, navigator, cartographer, and captain in the Royal Navy. He is hailed hero of the first recorded circumnavigation of New Zealand. Cook joined the British merchant navy as a teenager and joined the Royal Navy in 1755. He saw action in the Seven Years' War and subsequently surveyed and mapped much of the entrance to the Saint Lawrence River during the siege of Quebec. In three voyages, Cook sailed thousands of miles across largely uncharted areas of the globe. Cook first rose to prominence as a cartographer during the Seven Years’ War, when his detailed charts of the Saint Lawrence River helped the British pull off a surprise attack against French-held Quebec. He mapped lands from New Zealand to Hawaii in the Pacific Ocean in greater detail and on a scale not previously achieved. As he progressed on his voyages of discovery, he surveyed and named features, and he recorded islands and coastlines on European maps for the first time. In the early 1760s, he was given a ship and tasked with charting the island of Newfoundland off the coast of Canada. The map he produced was so accurate that it was still in use in the 20th century. Cook’s skill at charting the seas would later become a crucial tool in his explorer’s arsenal. He won command of his first round-the-world voyage in part because he could be trusted to navigate in uncharted territory and bring home precise maps of the lands he discovered. Cook was attacked and killed in 1779 during his third exploratory voyage in the Pacific while attempting to kidnap Kalaniʻōpuʻu, a Hawaiian chief, in order to reclaim a cutter stolen from one of his ships. HMS Endeavour, also known as HM Bark Endeavour, was a British Royal Navy research vessel that Lieutenant James Cook commanded to Australia and New Zealand on his first voyage of discovery from 1768 to 1771. She was launched in 1764 as the collier Earl of Pembroke, and the navy purchased her in 1768 for a scientific mission to the Pacific Ocean and to explore the seas near Australia. 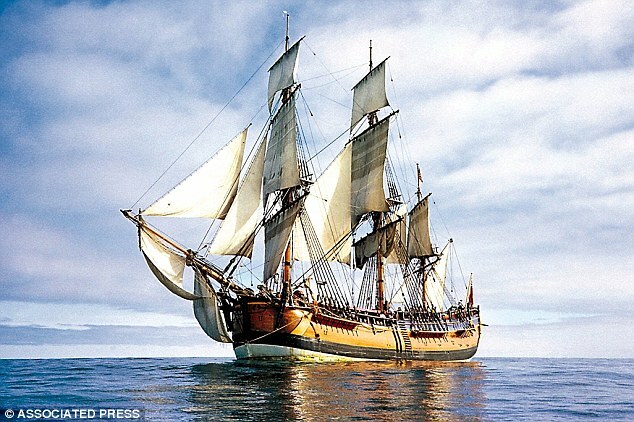 The navy renamed and commissioned her as His Majesty's Bark the Endeavour. She departed Plymouth in August 1768, rounded Cape Horn, and reached Tahiti in time to observe the 1769 transit of Venus across the Sun. She then set sail into the largely uncharted ocean to the south, stopping at the Pacific islands of Huahine, Borabora, and Raiatea to allow Cook to claim them for Great Britain. In September 1769, she anchored off New Zealand, the first European vessel to reach the islands since Abel Tasman's Heemskerck 127 years earlier. In April 1770, Endeavour became the first ship to reach the east coast of Australia, when Cook went ashore at what is now known as Botany Bay. In 1770, She resumed her westward journey on 26 December, rounded the Cape of Good Hope on 13 March 1771, and reached the English port of Dover on 12 July, having been at sea for nearly three years. Endeavour was largely forgotten after her epic voyage and spent the next three years sailing to and from the Falkland Islands. She was sold into private hands in 1775 and later renamed as Lord Sandwich; she was hired as a British troop transport during the American War of Independence and was scuttled in a blockade of Narragansett Bay, Rhode Island in 1778. Relics are displayed at maritime museums worldwide, including six of her cannon and an anchor. DailyMailAustralia today reports that Captain Cook's HMS Endeavour is finally found: Wreck of legendary ship used on first voyage to Australia 250 years ago is discovered off the coast of America ! Marine archaeologists who have spent more than two decades painstakingly searching for the vessel say they have now identified what could be the wreck's exact final resting spot. Details of what will solve one of the greatest maritime mysteries of all time will be officially announced on Friday in the United States. The event will take place on Goat Island, a small island in Narragansett Bay, off Newport, Rhode Island, near to where the scuttled remains are believed to be. Archaeologists learned 20 years ago that the ship was scuttled in Newport Harbour. But the Rhode Island Marine Archaeology Project (RIMAP), said experts have 'narrowed the search for the Endeavour from a fleet of thirteen vessels to five, and now possibly to one or two archaeological sites'. The Friday announcement according to MailOnline will involve archaeologists from RIMAP and the Australian National Maritime Museum (ANNM). The identification of the vessel's final resting place has raised hopes the HMS Endeavour will be able to be excavated next year. Director of RIMAP, Kathy Abbass, said the discovery would be significant for a number of countries, including Australia, the US, Britain and New Zealand. Interesting ! ~ amazing facts stranger than fiction ! !